Pentax was one of the first film camera brands to break into the digital space. In fact, the Japanese company was one of the very first to announce a full frame system, called the MZ-D prototype, way back in the year 2000. However, at the time, the new electronic format was just establishing itself, making it prohibitively expensive to produce the digital camera. Rumors also suggested the MZ-D was saddled with a woeful, 6MP Philips CDD sensor. As time whisked by, the camera ultimately withdrew from the public and Pentax moved on, focusing development on crop-sensor bodies and medium format digital cameras. Now, 16 years since its initial attempt, the firm is taking a crack at full-frame cameras again with the Pentax K-1, a daring DSLR in an age when mirrorless cameras are all the rage. In an interview with techradar, Pentax's team of designers told us that development of the K-1 started two years ago. On a cool spring day in Tokyo, a diverse group of 10 mechanical, electrical, design, software and optical engineers gathered for the first of many meetings for what would later be known internally as the "Full Frame Committee." "The development goal was not to follow the industry camera design trends, but to be unique, yet universal and simple," a Pentax K-1 project lead says. "The design concept was to meet the expectation of Pentax enthusiasts who are accustomed to high quality." While it's often hard enough to come up with one concept, the Pentax K-1 project actually began its life with three different designs. The first was based on the company's popular, crop-sensor K-3 camera, keeping it aesthetically in line with the rest of the K series. Another design emphasized the camera's flagship status and closely mimicked the Pentax 645Z medium format camera. Finally, a third concept was developed as a completely new design reflecting the Pentax K-1's position as a top-of-the-line model. In the end, the Pentax design team decided to go with the 645Z-inspired concept, while heavily borrowing elements of the K-3 to make it the ultimate SLR camera. "The grip is based on the well-loved 645Z, but [it] also incorporates the concave shape used in the K-3, providing a secure hold using the middle finger," a designer describes. Conversely, the Pentax K-1 pentaprism and optical viewfinder housing is strongly inspired by the hump seen atop the Pentax K-3. However, while the K-3 features a single-piece pentaprism, the optics inside the K-1 are arranged as a two-piece configuration, similar to the 645Z, to help reduce weight and size. "It was a challenge to provide a large, bright viewfinder that allows the photographer to view 100% of their composition, enable manual-focus accuracy even when focusing on stars in the night sky and easily visualize the bokeh effect of large apertures," an optical engineer tells us. "Also, unlike previous Pentax DSLRs, the K-1 viewfinder is equipped with an LCD overlay allowing for more information to be viewed in the viewfinder, such as APS-C crop, grids and multiple focus points." At the core of any digital camera is its imaging sensor, and the Pentax K-1 comes bursting with resolution, thanks to its 36.4MP sensor. The high-res sensor allows the K-1 to capture more detail than the Nikon D810 and almost every Canon DSLR (except the Canon EOS 5DS), it also reaches a much higher level of sensitivity, going as far as ISO 204,800. Beyond resolution and low-light shooting capability, the full frame team strived to push the sensor by integrating a new, versatile SRII 5 Axis Shake Reduction System. At its most basic level, SRII eliminates motion blur and camera shake when the camera is moving in the middle of an exposure. However, Pentax also expanded the use of this sensor stabilization system to introduce micro vibrations that smooth out moiré – artifacts that occur when a fine repeating pattern confuses the sensor – among other features. "Having a sensor mounted on such a mechanism provides us with the additional advantage of utilizing the technology for other features, such as Composition Adjust, Pixel Shift Resolution, AA Filter simulation, and even Astro Tracing," a Pentax imaging engineer explains. "In short, quite a bit is going on because the unique Shake Reduction features contain complex algorithms." Unlike other systems, the K-1 sensor is stabilized by a shake reduction system consisting of magnets and actuators along with a newly developed acceleration sensor, which all help to make it smaller. Of course, being a DSLR adds an extra complication of having to align a mirror in front of the sensor. Otherwise, shooters can't actually see what they are capturing through the viewfinder before they pushing the shutter button. 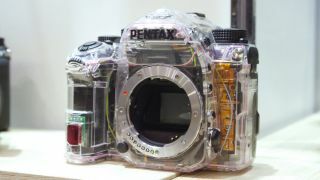 To this end, Pentax developed a smaller mirror box that also features a novel "floating design," in which the reflective sheet normally hangs in place before flipping up when users take an exposure. "To accommodate the new full-frame sensor and enable approximately 100% field of view, the main mirror and mirror box were redesigned and enlarged," a Pentax designer expounds. "The large mirror enables the capture of enough light to satisfy needs, while being just wide enough so we can keep the camera as compact as possible." Pentax could have easily made the camera significantly smaller and simpler by developing the K-1 as a mirrorless camera system. However, in the company's research, it quickly discovered the Pentaxian (Pentax enthusiasts) community strongly desired a full frame DSLR that would work with the existing line of K-mount lenses. On first blush, the Pentax K-1 might look like any other DSLR, but it actually has plenty of personality of its own. The overall shape of the K-1 is more angular and almost boxy compared to the common curves found on modern DSLR. Full-frame DSLRs are also, by and large, massive photography tools, and as such one of the team's biggest focuses was making the K-1 compact and comfortable to use and carry around. "We were uncomfortable with existing full-frame models because they were too bulky to handle and lacked operability and maneuverability in the field," the team elaborates. For starters, if you've ever had problems changing lenses in the dark, Pentax added a handy light on the lens mount among other places on the camera body. Around the back, you'll also find an articulating screen unlike anything ever seen before on a DSLR. Rather than simply pivoting up and down for angled shots or spinning to the side for selfies and video, the K-1 rear LCD articulates from a center axis on four metal arms. "The goal for the cross-tilt LCD was to design an adjustable LCD that is perfectly aligned with the center axis of the optical system to ensure accuracy," a Pentax design lead boasts. "The resulting design allowed for extreme durability in its unique construction." The camera's control scheme is also atypical compared to most DSLRs. There's the usual set up, with a mode dial and two control dials on the front and back. But, along the top deck, you'll find a Smart Function Dial and yet another unmarked dial to tweak settings like continuous shooting speed and HDR bracketing. "The quick-access, smart-function dial started out as a simple exposure-compensation adjustment dial, but later evolved into a device that puts functional control at your fingertips," a design team member notes. "The controls were designed in such a way that 'menu-diving' is kept to a minimum," he says. "Every dial and button is placed on the camera in such a manner as to not require the shooter to remove his or her eye from the viewfinder." On top of all the little niceties, the Pentax K-1 at its core is built tough as a tank, keeping it in line with most respectable DSLRs you can throw around. "It starts with a metal framework that is covered with magnesium alloy, making the chassis lightweight yet highly tough and durable, as well as electromagnetically shielded." Pentax's design lead says. "Then, water-resistant seals are applied in 87 different places including buttons, dials and covers, for durable use in the field." In many ways, the Pentax K-1 is just a full frame that's trying to play catch up with other DSLRs, like the Nikon D5 and Canon 1D X Mark II. But, it's also pushing toward the future. Pentax has leveraged everything it has learned from producing crop-sensor and medium format cameras into one tech-filled package that, at the core of it, is still a traditional, optical viewfinder. It's easy to predict the company pushing this concept even further moving forward. Though smaller than most full-frame DSLRs, the current camera is still massive next to mirrorless systems and even its film-based predecessors. So, there's plenty of work to be done. I can imagine a future in which an inevitable K-2 successor falls more in line with film SLR cameras in both aesthetics and a hopefully smaller body. Pentax could also leverage its sensor stabilizing tech to capture even smoother video. In short, let's just say the future looks bright for mirrors.